One of the main limitations of today’s navigation systems for spine surgery is that they often are not available until after the bone surface has been exposed. Also, they lack the capability of soft tissue imaging, both preoperatively and intraoperatively. The use of ultrasound has been proposed to overcome these limitations. By registering preoperative magnetic resonance (MR) images to intraoperative percutaneous ultrasound images, navigation can start even before incision. We therefore present a method for registration of MR images to ultrasound images of the spine. 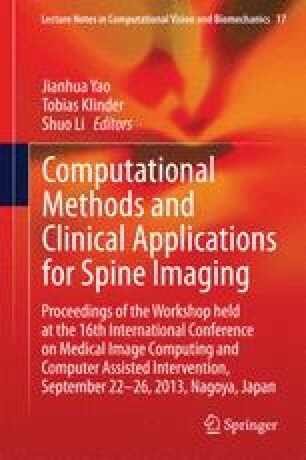 The method is feature-based and consists of two steps: segmentation of the bone surfaces from both the ultrasound images and the MR images, followed by rigid registration using a modified version of the Iterative Closest Point algorithm. The method was tested on data from a healthy volunteer, and the data set was successfully segmented and registered with an accuracy of \(3.67\pm 0.38\) mm. The work was funded through the user-driven research-based innovation project VIRTUS (The Research Council of Norway Grant No. 219326, SonoWand AS) and through a PhD grant from the Liaison Committee between the Central Norway Regional Health Authority (RHA) and the Norwegian University of Science and Technology.